Few among men are those who cross to the further shore. The rest, the bulk of men, only run up and down the hither bank. But those who act according to the Dhamma, will cross the realm of Death, so difficult to cross. ~ Dhammapada 85, 86. The impetus to initiate a sangha of local New Zealanders may well have started with the Ajahn Munindo (Keith Morgan) who was born in the North Island in 1951. He ordained in Wat Bovornives under the Thai Sanghraja Phra Somdet Nanasamvara in 1974, but in 1975 he reordained again under Ajahn Chah in Wat Pah Pong in N.E. Thailand. He returned to New Zealand for a period of six months in 1979 because of ill-health. During his time here interest grew, in both the cities of Wellington and Auckland, in having bhikkhus stay on a more permanent basis. 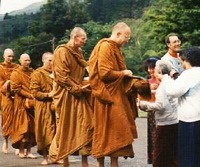 By 1985, interest was sufficient for the Wellington Theravada Buddhist Association to invite the Ajahn Viradhammo, accompanied by Ven. Thanavaro to move from the United Kingdom to New Zealand where they started the construction of Bodhinyanarama, or the Garden of Enlightened Knowing. The monastery, in a 51 hectare Native Reserve of regenerating bush 29 kms from Wellington, is set in a dramatic setting; at the foot of a steep hill covered with lush forest and tree-ferns. In 1989 a native New Zealander was accepted into the bhikkhu sangha and Bodhinyanarama held its first ordination. Ajahn Viradhammo ( Vitauts Akers ) was born in Germany to Latvian refugee parents. He encountered Buddhism while living in India and ordained in 1974 at Wat Pah Nanachat, the international forest monastery of Ajahn Chah in N.E. Thailand. Before coming to New Zealand he stayed with Ajahn Sumedho in the United Kingdom and was involved in the establishment of both Cittaviveka and Ratanagiri monasteries there. In 1994 he left New Zealand and presently resides in Amaravati monastery in the United Kingdom . Ven Thanavaro ( Giuseppe Proscia ), an Italian was ordained in 1979 by the Sri Lankan bhikkhu Ven Dr Saddhatissa on a boat in the river Thames, London. Subsequently he trained in the British monasteries. He left New Zealand in 1990 to found Santacittarama monastery in Italy. Ven Thanavaro disrobed in 1996 after 18 vassas as a bhikkhu. The sangha at Bodhinyanarama is also associated with another vihara in the city of Auckland and its bhikkhus extend their teachings to several cities in both North and South Islands. Apart from Bodhinyanarama, there are several other Theravada viharas set up by the Thai, Laotian and Khmer ( Cambodian ) communities. Seeing The Way, Amaravati Publications, 1989. Photo 1: Almsround in New Zealand. 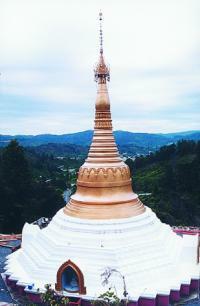 Photo 2: Stupa at Bodhiyanarama.